SECURIO - The new aesthetic style in disposing confidential data and documents. Cutting edge colour and form. Elegant and dynamic. Discreet and yet eye-catching in the smallest detail. The optimum design of all cutting unit components ensures smooth operation, saves valuable energy and reduces wear. All motors are designed for continuous operation. Relax your sense of hearing. Great emphasis was placed on attractive sound design during the development phase. 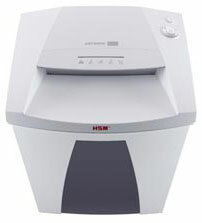 The SECURIO shreds your documents with a pleasantly quiet operating sound. The intelligent energy management EMCS sets the SECURIO to sleep mode when not in use, which saves up to 30% of the energy and switches it off completely after 4 hours (real zero power consumption). This saves up to 70% of the energy consumption of a conventional standby function.